Leaders are individuals who guide or direct in a course by showing the way. 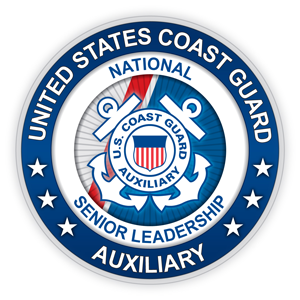 The Coast Guard Auxiliary senior leadership possess the highest standards of professionalism and personal integrity. This is exemplified in their adherence to the Coast Guard's core values of honor, respect, and devotion to duty. They strive to ensure that the Coast Guard Auxiliary can complete its missions and remain Semper Paratus, Always Ready. The United States Coast Guard Auxiliary – the best trained most valued maritime volunteer organization in the world – highly effective during normal operations and ready for emergencies. Honor – Integrity is our standard. We demonstrate uncompromising ethical conduct and moral behavior in all of our personal and organizational actions. We are loyal and accountable to the public trust. Respect – We value our diverse membership. We treat each other and those we serve with fairness, dignity, respect, and compassion. We encourage individual opportunity and growth. We encourage creativity through empowerment. We work as a team. Devotion to Duty – We are volunteers who seek responsibility, accept accountability, and are committed to the successful achievement of our organizational goals. We exist to serve. We serve with pride. Mission - Our members are trained and ready to execute all authorized Auxiliary missions according to exacting standards, providing the Coast Guard with an effective force-multiplier for normal, backfill and surge situations. Leadership - Proficiency in leadership, at all levels, is imperative. A focused development program of training, coaching and assessment is readily available to all members. Excellence - Recruiting, retaining, and rewarding excellence are essential. We foster a culture of excellence through inclusion and engagement to enable high quality performance, which is crucial to our ability to carry out missions.